Welcome to the somewhat delayed Part 15 in the continuing rollout of our list of 2014′s Most Infectious Extreme Metal Songs. For more details about what this list is all about and how it was compiled, read the introductory post via this link. For the other songs we’ve previously named to the list, go here. Because of interference by my day job, I missed adding an installment of this series yesterday, but we’re rolling onward with it today. I’ve thoroughly enjoyed both of the songs in this edition, and I’m pairing them here because both songs are also inextricably linked in my head with the videos that were released for them. I still think Once More Round the Sun sports one of the best album covers of 2014, by Oakland-based artist Skinner. The album as a whole reflects the band’s continued crossover movement, which began with The Hunter, into the realm of hard rock — albeit with both prog-y and sludgy ingredients still quite evident in the mix. I don’t begrudge them the decisions that led to these two albums, though I don’t consider either one of them unqualified successes either. 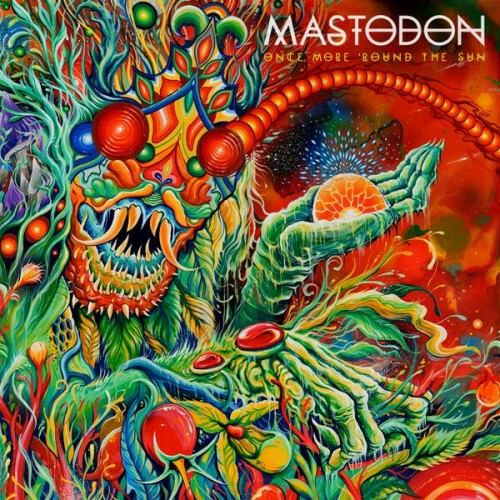 Despite those misgivings, Mastodon remain a phenomenal live band, I still get quite a kick out of the vocal tag-team among the band’s three vocalists, and they still turn out some highly infectious songs that are still heavy enough to get their hooks in my head. Which brings me to the next addition to this list. Like a couple of other songs I’ve previously included on the list, “The Motherload” really isn’t extreme, and some of you will argue that it really isn’t metal either. Fair enough — but it really is very infectious, and it’s close enough to metal that I don’t feel that including it is too much of a cheat. The Crossing was the 2014 album released by the Irish band Ilenkus, and it was reviewed for us by Leperkahn, who himself has some roots in the old sod. It also sports a wonderful album cover, in addition to a lot of excellent music. Leperkahn described the album as one “that further expands on the Dillinger Escape Plan-meets-The Ocean sound they had used to breath new life into post-metal”, with “an ebb and flow of catharsis and despondence that runs like a thread throughout all of” the album. In a nutshell, it shows one of the band’s three rotating vocalists, Chris Brennan, walking along a Galway pedestrian thoroughfare on a busy day. The camera stays focused on him, and he stays focused on the camera as the crowd flows around him. He’s singing the song as he walks — and from the looks he gets, I’m pretty sure he was actually shrieking and growling the words at full volume rather than lip-syncing (though we’re hearing the studio track in the video). This was obviously shot in one take, and it’s damned impressive — not only for the balls it took for Brennan to do this, but also because he never gets distracted from what he’s doing nor looks self-conscious for one second. And on top of that, he nails the voiceover in sync with the recorded track. That’s some intense focus. Kudos again to cinematographer Ethan Copage and to whoever was clearing the way at his back during this stroll. This couldn’t have been easy to film either. That video for ILENKUS is incredible. Seriously. I really wish I could see a “making of” video. Or better yet, have been there when it happened. That solo on The Motherload is a straight flashback to Crack the Skye, and easily one of the best parts of the album. The fecking priceless reactions of the bystanders in that Ilenkus video totally make it, whether it’s the confused stares or the people waving at the camera thinking they’re going to be on TV or something. All that aside, it’s a kickass song, too. Alas, the trend of female rump-shaking has eventually reached NCS. Also, most of the females don’t seem to have done a single squat in their entire life. I will now rectify these scenes of the posterior by watching music videos with a lot of angryface and no jigglybutt. In our defense, this happened only after a multi-year study by the NCS Department of Butts, twice delayed by our investigators becoming drooling cretins during the course of their work. “the NCS Department of Butts” I think that’s the new banner head?